I’m finding that so much of being a first-time mom is learning things AS they happen. It’s hard to plan ahead because you don’t know what’s coming! One of these things has been the introduction of cold weather. Sixth: undershirts. warmer pajamas. a bunting? 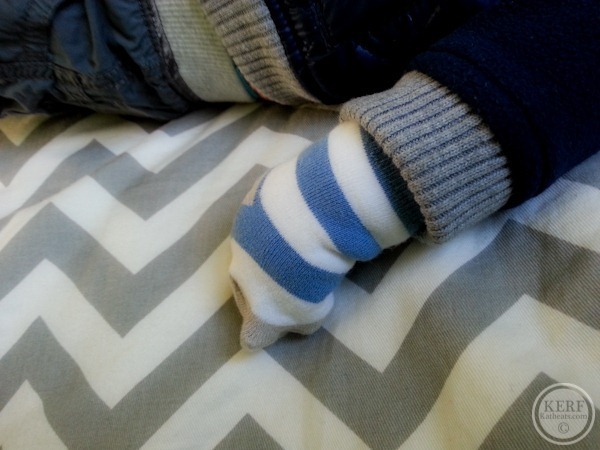 Last week I put socks on Mazen’s hands to keep them warm. I thought it was brilliant, but his hands were still a little chilly after our walk. My mom sent me some fleece mittens from Amazon the next day. We’re lucky that Virginia never gets REALLY cold, but freezing temps require lots of baby layers. Please share your advice: what items should I seek out now in anticipation for freezing weather? For walks. For snow days. For indoors. For outdoors. Amazing photo to finish!!! Learning as you go is what life is all about sure! It’s what makes it all the more fun; and even when you have more children there will be a whole load of new things to learn 🙂 A big fluffy all in one for hands, toes and head is great! One important thing to know is to not put a big puffy coat on before putting the baby in the car seat – in case of an accident, the coat will compress and the straps will no longer be tight enough on the car seat: http://www.car-seat.org/showthread.php?t=151522 Because of that, I never bought any big puffy or heavy coats for my baby last winter, just lots of lighter layers and a blanket over the car seat for the walk from house -> car. And babywearing is great in the winter, a cotton wrap like the Moby will keep your guy nice and warm against you for walks in the cold weather. Once your baby gets old enough to start pulling off hats, a warm hoodie works well. Also, Mazen is in the age range for the biggest risk for SIDS (2-4 months) (and male babies are more susceptible than girls), so you want to make sure to not overdress him at night – I find that a cotton footed sleeper + either cotton sleep sack or cotton swaddle works well at night – I’ve heard to avoid fleece at night because it can get too warm, but I’m not sure how valid that is. And make sure to keep the room at 68-72 degrees at night. I will second the cotton footie pajamas + cotton swaddle. That is what we did for my son and it was perfect. Fleece was always too warm for him when he was that age. What the heck do I put her in then? She’s too big to be carried in in her car seat…and it doesn’t seem practical to change her into a bunting just to walk into daycare? It’s recommended to not put anything heavier than a fleece on a child in the car seat, so I have a Columbia fleece for my toddler. If I have something heavier on her, I take it off of her before putting her into the car. With a baby still in an infant seat, I’d put a blanket over the seat. There’s also the BundleMe covers that go over car seats, but I am not sure if they’ve been used in crash tests so I’d want to check into those more before using. I had an April baby who moved to a convertible seat before winter, so I never used more than a blanket tossed over the seat. Yeah, definitely be careful overdressing in a car. But definitely bundle up outside – depending on where you live, it’s cold. I know where I live, I bundle up my daughter much like I bundle myself and frequently check her to make sure she’s not too hot or cold. Long-sleeved footie pajamas are lovely and warm to wear inside. I ran out yesterday to get a hat and a coat for my baby. Even in LA it is cold! I am so not prepared! I was going to say what someone else already did. Just remember nothing thicker than a thin fleece jacket when in the carseat. carter’s makes great fleece pajamas and they also make nice “sherpa” buntings great for use in the stroller. Also because he is young and still doesn’t have much hair you should put putting a beanie style hat on him under his hood, a hood isn’t enough warm. Carter’s has amazing warm weather stuff and they e-mail coupons and have great sales a few times a week. Also babies r us is currently having a huge carter’s sale and I believe they have a warm and fuzzy bunting thing for only $2 right now, it’s only in store though. We used a one piece fleece suit for the stroller, with fold over hands and feet so our little guy didn’t need mitts or boots. I was going to attach a link to where we got it , but unfortunately the company does not ship to the US. It is just a single layer of fleece but quite warm, we went out with our BOB in all kinds of weather with the weather shield. In the car seat we just put our little one in a lightweight coat and then blankets on top, and a canopy cover for the walk to and from the vehicle. My daughter loved sleep sacks! A full body snow suit/winter coat was perfect for keeping her warm during walks since I couldn’t stand being inside all winter and figured babies need fresh air too! The last photo is awesome. 🙂 His puffy jacket is too cute! 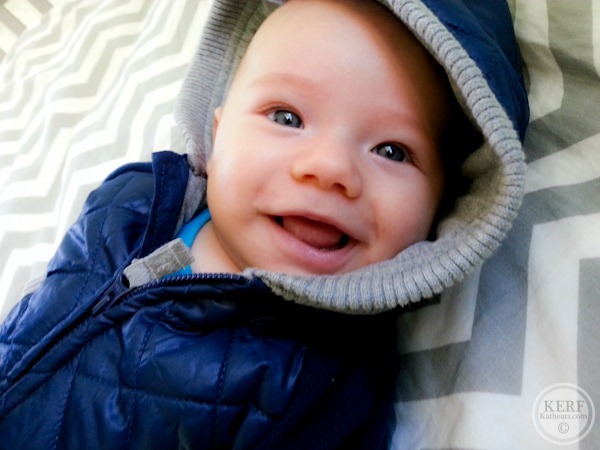 All of this baby gear talk is making me want to get myself in baby gear mode ASAP – hah! the bundleme by jjcole is awesome for stroller and carseat! Yes! Great product! We have a really warm one for the colder months and a lighter weight one for the fall/spring months. I also really love the footsie pajamas. Keeps hem nice and toasty plus they can wear a short sleeve onesie underneath. My favorite thing (and I have an October baby in Chicago) is e JJ Cole Bundle Me. It’s for he car seat and keeps them so toasty without having to put he baby in bunting or a coat. It goes over he car seat and zips up. You can find it at Target, Babies R Us, etc. They have different options too that are more lightweight or even go over the stroller. I recommend it to any Mom in the winter. I bet a good bunting could easily be a secondhand score if you have any Once Upon a Child stores or a local equivalent. Hanna Andresson has socks that actually stay on. They are great. Even though they crack me up because even the little baby ones have traction dots on the bottom, which my 2 month old is not using, of course. Pulled their hats OFF, that is! I live in northern Alberta (Canada) and definitely need to dress baby for colder temps!! Always wears pants and a long sleeve shirt – sometimes a cardigan or hoodie over top – and if its a shirt, not onesie – she wears an undershirt so her back doesn’t get cold. For the car we got a shower cap style cover and that protects her from the elements but doesn’t get her too warm!! Landsend used to make a nice fleece insert for the infant car seat. Its basically a sleeping bag, but the seat belt straps go through the back, baby gets strapped in normally and the top covers him up. Here in NH its a must. Its great because if you are out and about walking, maybe stopping somewhere for lunch and the baby is sleeping, there is no struggle to get him out of his coat, all you do is pull back the covers a bit and voila no waking the baby and no overheated cranky baby! Sounds like you’re figuring it out. Yes, you don’t realize you need those things until you don’t have them! I really liked our bunting – if you do get one I would suggest one with a hole in it for the carseat buckle to go through. Love the photos of Mazen in his coat! It’s hard to plan ahead because you don’t know what’s coming! = Isn’t that the truth! Kids will ALWAYS keep you on your toes! He’s precious all bundled up! Hello from Minnesota, aka freezing-land! Ok, we layered all the time when Wrigley was really little. We bought tons of white long-sleeve onsies and used those as a base for every outfit, day and night. Second, in the winter he lived in Children’s Place footie PJs that zipped. It was easy for changing diapers, but kept all body parts warm. I often put socks on over those footie jammies on negative temp days. Finally, we bought a fleece cover for his car seat that insulated heat on the back and front of his body. I called it his sleeping bag and he was always so warm in there. I know the New Moms podcast warned about car seat additions and layers, but some things are necessary up north. you should not be using things like jj cole that has the straps threaded through it. you should never be using anything with the carseat that did not come with it. the boots that go over the carseat are fine anything where you thread the straps through are not. JJ Cole Bundle Me. We lived in WI and now IL (<– not much better weather) and we use it on our car seat and stroller. It's very warm and they say can replace the need for a coat. I still put a light sweater on and winter hat. It's been in the 30's and we still go for walks and our lady is sweating when we take her out. It's also very eat to take on and off to switch from seat to stroller or come off for changing weather conditions. A BundleMe comes in handy a lot for the carseat/stroller. Then you don’t have to spend as much time bundling the little guy. We used one a ton last winter! And while their extremities sometimes feel cold because they don’t have great circulation yet, I read that a good test of whether they are actually cold or not is to feel the back of their neck. Definitely makes you feel a bit better as the parent to know they are actually warm! I agree with Tracy about the car seat “bag”! We had one for our daughter and it was awesome! A one-piece fleece suit is SO handy, especially if it has a hood. It’s just one item that you need to remember, instead of socks/booties, AND a jacket, AND a hat! The ones here in Canada, are from MEC (www.mec.ca) and even have built in mittens. A good rule of thumb is that the baby should be wearing one more layer than you are. So, for example, that photo of you in your house when you have on a puffy vest and your mom’s friend has on a coat (if it was cold enough for those) Mazen should have on a coat and a hat, and probably mittens. He should usually have a hat on if outside and it’s slightly chilly. If you have gloves on outside, he should have mittens and a blanket on. If you have on long pants, he should have pants + long undwear or pants + being in a blanket, bunting, etc. 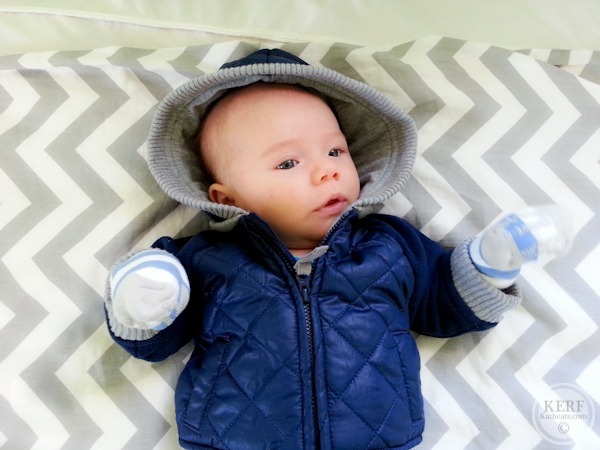 As far as what to buy, look at your own warm clothes inventory and get him similar things in baby sizes. Try not to use photos as the whole story… Often we are coming and going and just removed his outerwear or are about to put it on or had him in a blanket that we take off for a photo. Just pointingt this out about the vest/coat photo you reference. I know! I tried to add a disclaimer but was more just using it as an example. My friends’ pediatricians always said (here in Michigan!) that one more layer than you are wearing is usually sufficient. The in-motion adults are moving around which helps warm us, but the wee ones can’t regulate their body temp well, and tend to need a bit more help. And I second the all-in-one suits for the outdoor time. Or you will forever either be buying gloves or searching for them. They figure out how to get those suckers off faster than just about anything else. It does get cold in VA, it’s winter! A few years ago, we had “snowpacalyse” and had over 2 feet of snow 2 separate times. According to the Farmer’s Almanac, we may have a winter like that again. I’m talking -20 REALLY cold. If we got two feet of snow, I doubt I’d leave the house! My son is 6 mos old so I have started running into the same issues. We used the sleep sacks earlier but now that he rolls he hates it at night so I use the footy pajamas. The ones with a zipper are easier for changing a diaper if you are sleepy. I had a couple of super cute hats made by happy hats by the girls ( on Facebook) that have ear flaps…so cute. My son gets really warm just from the hat. I never put a jacket on in the car seat. We use long sleeve onesies/pants combos and then I throw over a warm blanket. Old Navy has great socks that go all the way up to the knee so if Maze starts to kick off socks these stay on. Definitely get a one piece fleece coat. As someone said, not something big and puffy. The fleece ones tend to be thinner and work fine in a carseat. My son wore one of those and then I would tuck a blanket over him and one over the carseat while we were outside. The blankets are great because they can easily be removed in the car when it heats up. A tip: Get one where the zipper comes all the way down to the feet. The ones that have the zipper that only goes to the top of the legs are a huge pain to get baby in and out! Also, my son has that same blue Old Navy jacket and I love it! So adorable! I suggest a carseat cover with a blanket to keep Mazen toasty without the coats, etc. We live in MN, so we know cold and this worked great! I just ordered the BundleMe by JJ Cole today! A friend recommended! I used the warm Bundle Me’s over my girls car seats when they were infants. Kept them so toasty warm! And no need for anything more than their normal clothes underneath the carseat. The rule of thumb is one more layer than the adults have on when it’s cold, right? I live in a MUCH colder climate than you, and I have opted not to buy Anderson a winter coat for this year. It’s not safe under the carseat, and he isn’t old enough to play in the snow (maybe by the end of winter, which in Montana, is late!) I sort of think winter coats for under 1 are just a baby industry gimmick. Adorable, yes. I dress Anderson in either a long sleeve onsie with long pants, or a once piece outfit. If I don’t have a long sleeve onsie, he gets a long sleeve plain white onsie (the thin ones) under a short sleeve onsie with pants. In the house, and if we are running errands, I just dress him in socks. We were blessed to recieve one as a gift, it fits perfectly over his clothes, and keeps him toasty warm. If we go out and run errands, I put a hoodie over his long sleeve, a thin hat, and then the hood up. sometimes I put a pair of Robeez shoes on over his socks, if it is really cold, or if we are going to be outside for longer than the few minutes to and from the car. I know it’s not environmentally friendly, but I also start the car about five minutes before I put him in it. Top it all off with a fleece blanket that I keep in the car to cover him with if needed. Yes, to the Robeez (or similar) shoes! They were the only things I could find to keep my kids from kicking off their socks continuously when they were babies. They sell that type of shoe lots of different places now (Target, etc.) and I totally bought into the whole idea that kids should learn to walk basically bare-footed, so my kids never wore any “regular” shoes until about the age of 3 or 4 years old. BOB strollers have a cold weather cover you can buy separately, if you plan on doing a lot of winter walking or running! It is not safe to use anything aftermarket that basically touches the straps of a carseat. If the carseat wasn’t tested with it, the company will not back their product should you be in an accident. Bundle Me originals are fabulous, for a stroller, but keep them out of the carseat! A light weight fleece like others were saying is acceptable, but bulk is not. It looks like the Bundlemes go over the car seat and the straps are still up against the baby unharmed. Am I understanding how it works wrong? I have heard the same about safety and not using anything that didn’t come with the car seat, but it looks like this just goes over the edges? Its confusing! There are so many options! Cool, thanks! Maybe ill get this shower cap one. I know exactly where you are coming from! We put socks on our little guy’s hands last weekend for our walk, too. Here’s his attire: 2 pairs of socks, short sleeved onesie, long sleeved onesie over that, fleece pants tucked into socks to block out any breezes, giant snow suit (soft, like a sleeper) with closed feet and fold-over cuffs for mittens (over his sock mittens), plus a hat and the hood of the snow suit. Then into stroller with a blanket over him, tucked in around the edges. I’ve been putting leg warmers on miss B! Great for protecting her little knees while crawling and super cute!! They make cute ones for boys too! My little legs and baby legs are 2 sites (the co-op link I emailed u also sells them for MUCH cheaper than they r on the website… 2.50-2.75 each). Hey Kath and Mazen! My suggestion would be to base his temperature on how his core (tum tum and back ) feel, rather than his hands. Of course they shouldn’t be left to be freezing of course but they will always be a little cooler than the rest of him. Also layers that can be easily loosened or removed.. I find it can be freezing outside but then walking into over heated shops can make them get hot. I always undo my lil mans jacket as we walked in the door and zipped ur back up as we walked out! Oh and my good friend with a baby boy who is from Iceland (so super cold) swears by baby tights for boys and girls. Layer under pants for very cold days. If the room he sleeps in gets cold at night then I suggest footed pjs and double swaddle. As others have mentioned be careful to not overdress mazen. Hooded sweatshirts and hats are great and tuck in warm blankets for walks. We put a long sleeve onesie under our Halo sleep sack wrap for our little one on chilly nights, and short sleeve on warmer nights (since it’s been fluctuating back and forth here in NOVA). Having moved here from Minnesota, I’m very thankful this isn’t extreme cold though. I’ve also found that some of the Carters outfits with layers (like a onesie, with a snap over top or something) are great for when we go out, because you can’t put a bulky jacket on and have the carseat straps fit well, but it gives an extra layer. We also use the breathable swaddling blankets like you have on his legs in the car seat (over a pair of pants and socks on the feet of course. Also, Old Navy has great, warm fleece baby pants). This weekend at a car seat check, the Sheriff’s department advised us to never use any thicker blanket on his legs, especially if he’s alone in the back seat, because in a rear end accident, it could come up over his face and suffocate him, and if it’s an extreme hit to the rear end, you may not be able to dislodge the blanket in time. I was thankful for the advice. The biggest thing is have a proper fitting hat on his head when he goes out, even just in the car. The most heat escapes through the head, so even just a cotton cap will help, but that cute winter hat you have with the ears looks perfect! Interesting on the firemen advice with the thick blanket. I wouldn’t have thought of that. I suppose you could put it on them and remove it when you start driving and the car is warm and put it back on at your destination.